There is no doubt that our artists inspire visitors and each other, and we have often heard visitors say wonderful things which could instigate conversation and drive our creativity even more. 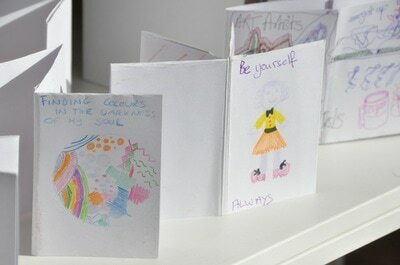 At ‘Art in Mind’, visitors were invited to make origami books and fill them with drawings, quotes, stories which can inspire others and add them to our inspiration library, which now lives at the SHARP gallery. The books ranged from thought provoking narratives of real life experiences to expressions of motivation and persistence through fun humour or poignant statements. People of all ages took part in the project from young children telling stories about animals and monsters and quotes form Hermione Granger and Anne Frank to pearls of wisdom from older members of the community. The process of drawing, colouring and reflection possesses its own therapeutic effect and the open atmosphere created a special communal feeling among artists and participants.